The Lexus brand is a hybrid leader, dominating the luxury segment and with plans to expand its offerings. Luxury manufacturers typically supplement their gasoline-powered models with diesels. Lexus does offer diesels in some markets, but it relies on hybrids exclusively in North America to provide efficient models for its fleet. 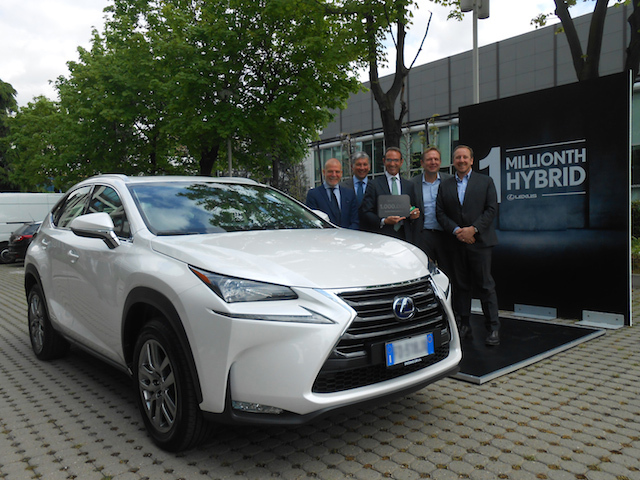 This month, Lexus reached an important milestone: Toyota’s luxury brand sold its one millionth hybrid electric vehicle, an NX 300h delivered to a customer in Milan, Italy. Eleven years after delivering its first luxury hybrid, Lexus is firmly entrenched in a market few of its competitors dare to compete. 1 millionth Lexus hybrid sold globally, April 12, 2016. First, to reduce vehicle carbon dioxide emissions by 90 percent by 2050 in comparison to 2010 levels. The automaker plans to achieve this goal through its next generation of vehicles, including its all-new Toyota Mirai fuel cell vehicle. Although not yet set in stone, Lexus will benefit from hydrogen technology just as it has from hybrids. Witness the dashing Lexus LF-FC concept introduced at Tokyo Motor Show 2015. Second, to reduce life cycle carbon dioxide missions to zero. Going beyond the emissions created via traveling and manufacturing, the automaker has eliminating all other emissions in mind, including materials production as well as the disposal and recycling of its vehicles. Third, to eliminate production-based emissions. The third element of Toyota’s six-part strategy is to develop and introduce low carbon dioxide technologies at its manufacturing plants. This means employing various renewable energy sources as well as incorporating hydrogen energy, something the company is currently pioneering. Fourth, reduce water usage. The planet is facing many challenges when it comes to clean drinking water. For its part, Toyota is intent on reducing the amount of water needed in the manufacturing process, including in painting and forging. Beyond reducing water consumption, a comprehensive water purification plan will return much of that water to the earth. Fifth, expand its recycling initiative beyond Japan. Toyota has carefully developed, implemented, and expanded its recycling efforts in its home territory, Japan. The same efficiencies the automaker has learned there, it plans to roll out across its global footprint. Sixth, to operate and live harmoniously with nature. No doubt, the manufacturing process extracts much from the earth. For its part, Toyota is planting trees at its manufacturing plants. It has also been exploring ways to provide a more harmonious relationship with nature on a global scale. One such initiative is its Toyota Green Wave Project, designed to connect regions with green corridors. As for its current hybrid efforts dating to the sale of a Lexus RX 400h in 2005, the company claims a number of firsts in the luxury sphere. In 2006 the first hybrid luxury sedan, the GS 450h rolled out and was followed the next year by the LS 600h, what it describes as the most powerful luxury hybrid sedan. In 2009, the first luxury compact model, the HS 250h, was introduced and was followed by the CT 200h, the ES 300h, and then by three other models: IS 300h, GS 300h, and the NX 300h. The latest model to roll out is the RC 300h sports coupe, introduced at the close of 2015. Although North America is the largest market for Lexus hybrids with just over one in three models sold there, Europe has taken to hybrids in a big way. Indeed, in 2015, Lexus hybrid sales in Europe topped North American sales. Japan is also a big market, accounting for 22.5 percent of all Lexus hybrids sold. The RX Hybrid is Lexus’ best selling model too, with more than 335,000 sold since its 2005 introduction. Other strong sellers include the CT and ES lines. Notably, the GS line is the only one offering customers a pair of powertrain options: GS 300h and GS 450h. As for the one millionth customer, Aldo Pirronello, he expressed surprise and honor when he learned his 300h purchase enabled Lexus to reach this important milestone. Photos courtesy of Toyota Motor Sales, Inc.